Leach wrote the following in his essay “Towards a Standard”. It is obvious that the standards of the world’s best pottery, for example, those of the T’ang and Song periods in China and the best of Ming, Korean Celedons and early Japanese Tea Master’s wares, early person, Syrian, Hispano-Moresque, German Bellamines , some Delft and English slip ware, cannot well be applied to industrial work, such pottery was a completely unified human expression. Whilst his references were broad, it was his intimate knowledge of China and Japan that dominated his book and the images presented. this along with the discovery in the vaults of the ESTC lib ray I discovered a small text – Chinese Ceramic Glazes by A L Hetherington, have been the foundations for my creative quest ever since. This was a time where there was very little technical information available and many potters, including some of our teachers, closely guarded what knowledge they had gathered, so discovering this little gem was a revelation. Not only did it have many technical observations but its major focus was on the pots of the Song dynasty. Chinese ceramics can be approached and studied from several different angles. The most interesting, or at all events the most popular, is from the aesthetic standpoint and most that has been written on the subject for the help and guidance of students is based on archeological researches, coupled with the scrutiny of Chinese texts.The approach in this little book is from a different point of view, the scientific one. Whilst the breadth of influences on ceramists has broadened dramatically over the last 40 years, it is universally accepted amongst scholars that the potters in the period of the Song Dynasty in China created some of the most innovative ceramics ever made, many of which have not been duplicated since. Many of the earl photos of these pots that I was able to find were from the Percival David Collection at the University of London and the Victoria and Albert Museum in London(V&A) , so on my first trip to the UK in 2004 I made a b-line to both of these institutions. The Percival David collection was on display in an old building at the University, over 3 floors, and, as was typical of that time, filled to overflowing with stunning Chinese ceramics in glass cases. The collection has since been moved to the British Museum where, although what is now on display is displayed magnificently, much of it is now in storage. My focus in 2004 was on a wonderful waxy light blue glazes called Kuan, and I took little notice if the black pots siting in their display cases at the back of one of the many little rooms in the gallery. In March of 2007, I walked to my letterbox to find a postcard from my friend Steve Harrison, who was in London at the time for an exhibition of his pots. I turned it over to find this image. I was immediately taken by the simple beauty of this pot, I had heard of these mysterious oil spot glazes but had never seen one as stunning as this one. The bowl and its glaze seemed to be in perfect harmony. I put the postcard in pride of place, up on my bedroom mirror and over the last 6 years I looked at it everyday and gradually it has permeated my being. I am particularly draw to the elegance of its form, the way it fills its space, I was surprised to discover that it is not large, only 9cm in diameter. In terms of a tea bowl is has a almost perfect form. I have since came to understand that this is a Northern Oil Spot, not Jian Ware at all. I have since discovered there are many varieties in both the glaze and form of these pots by suffice it to say the ones made in one village near Shuiji in Fujian Province in China became the focus of my research. 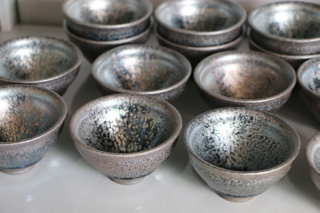 The majority of these were simple black glazed bowls, which both Japanese and western potters would call Tenmoku. They were made in large quantities in large communal workshops, raw glazed and fired in their 10s of thousands in large woodfired dragon kilns. Every now and then there would be what can only be described as defective, a pot effected by a faulty firing, and most of these would be seen a not meeting the required standard and, along with the many kiln accidents, end up on the shard heaps. Rarely one of these accidents would display a characteristic that would enchant the observers and become prized. The most common of these rarities would be what has become to be know as Hare’s Fur, where the interaction between the glaze running down the curve of the bowl and the crystalline iron on the surface creates an effect resembling that of the fur of a hare. Much rarer where the various iterations of Oil Spot glazes. These were so highly prized that I suspect that the potters would have spent immense amounts of energy trying to recreate them, but in this they failed. The varieties of Oil Spot glazes can consist of barely imperceptible pattern of black spots, distinctive purple spots, golden orange and silver spots, iridescent spots and finally, as can be seen here, gold spots surrounded by haloes of blue. 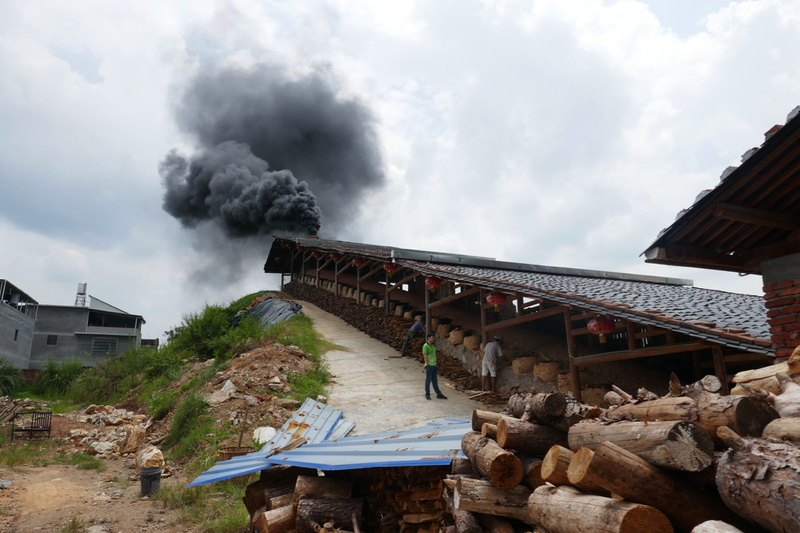 Section of the only known Blue Oil Spot in China. There are only four Blue Oils Spot bowls know to have survived and all are in Japan, only one is on display in the Mihon Musem in Tokyo and even photos of this one are hard to find. I have not yet been able to find any photos of the other 3 bowls, needless to say three of them are classed as Japanese Nation Treasures and all are priceless. I doubt when I visit the museum and collections even as a researcher I will get very close. Another attraction to me of these bowls is the place they held in both the Japanese and the Chinese Tea Ceremonies. Jian in Fujian Province, China is just below the Zen Monastery on Mt Tinamu, and it is this proximity which gave rise to the Japanese name for this ware Temmoku. (Tenmoku). Tea began as a medicine and grew into a beverage in China, in and it entered the realm of polite society as one of the amusements. The fifteenth century saw Japan ennoble it into a religion of aestheticism—Teaism. Teaism is a cult founded on the adoration of the beautiful among the sordid facts of everyday existence. The Japanese Zen monks came to China to the monastery at Mt Tinamu to study and during there stay were introduced to the Chinese tea ceremony. At this time in the song dynasty the black tea bowls of Jian had come into favour as the preferred bowl for preparing and drinking tea, as the fashion had moved from leaf and gunpowder the to powdered free Tea which the aristocracy felt look most pleasing in the black bowls. The Japanese monks too both the green powdered tea and the black Jian tea bowls back with them and they became the genesis of the Japanese Tea Ceremony. The Japanese ceremony took on religious overtones of both Shinto and Zen as can be seen from Kakuzo’s quotation above, whilst the Chinese ceremony remained amore social and secular. Those of us who are interested in these glazes and the pots that wear them so beautifully owe a lot to the fact that the Japanese came to prize them so highly within their own culture and, even when tea bowl fashions changed with the movement to the use of local artefacts, the Japanese potters continued to produce high iron Temmoku glazes for both domestic and ceremonial use. These bowls became to be so treasured in Japan, to the extent that none of the rarer whole bowls can be found in China today and all the rarest Oil Spot pots are in Japanese collections. Jian Ware, Open Shape, Oil Spot Glaze. Raphael goes on to talk about the possibility of moulding clay and baking it in embers. The first pottery vessels were round hemispherical bowls, but the very plastic nature of clay inspired variations with each new form needing an adaption of prototypes and the process of refinement of the basic utilitarian shape evolved. Symmetry was imposed by the need for balance, and for the same reason a foot or base was used. Potters have always experimented with form for its own aesthetic sake, to ensure that it functioned well and increasingly for a function that is no longer strictly utilitarian. Pots became to be used for religious ceremonies or to hold offerings or the ashes of the dead. Such ritualistic functions justified refinements not required for function alone. 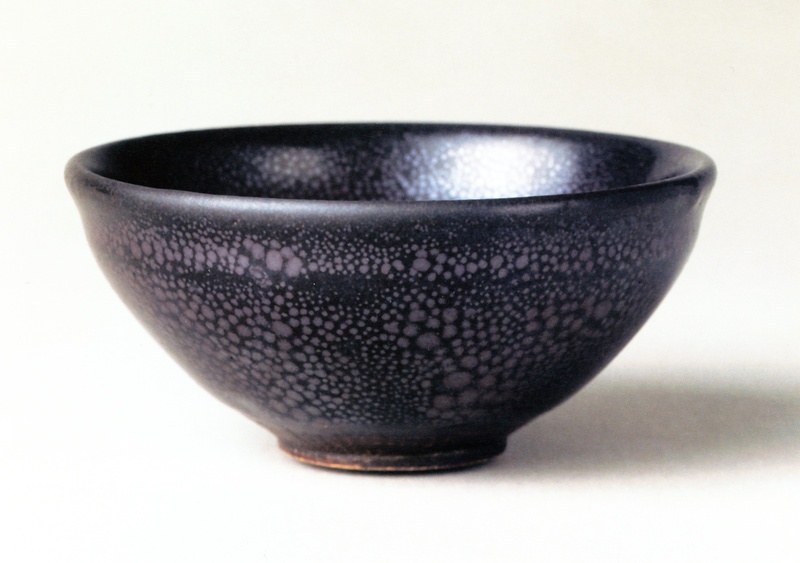 It is essential to note that from the very beginning in the evolution of the bowl that form and surface respond to a spiritual need in man and there is no doubt that the form, decoration and glaze of the Jian Tenmoku bowls were directly influenced by there use as tea bowls and in the Tea Ceremony. Jian Ware Valley, Shard Heap in the foreground, Rice fields behind. 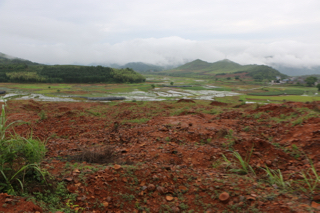 Here, in the region of Chien, were made the tea bowls of Chien ware which form the subject of this study; here was grown the tea for the drinking of which the bowls were intended; and by the roads and waterways of Chien the tea bowls (and the tea) began their journeys into the outer world. As one of the approaches to the study of Chien ware, it may be of interest to consider the names by which it is known. The term temmoku has tended to eclipse the term Chien to such an extent as to be adopted amongst collectors the world over—always excepting China. The history of Chinese pottery is not a continuous story, (it appears to jump in time and place for no obvious reason,) there is however a common thread of styles, techniques and skills which link people in fascinating ways. This is true of Jian, as far as we can know, from the T’ang dynasty to the middle Song Dynasty, Jian was a minor pottery centre. Changes in style and type of pottery occurs in response to social, economic and technical demands and each and every geographic environment offers the potters different challenges and opportunities. 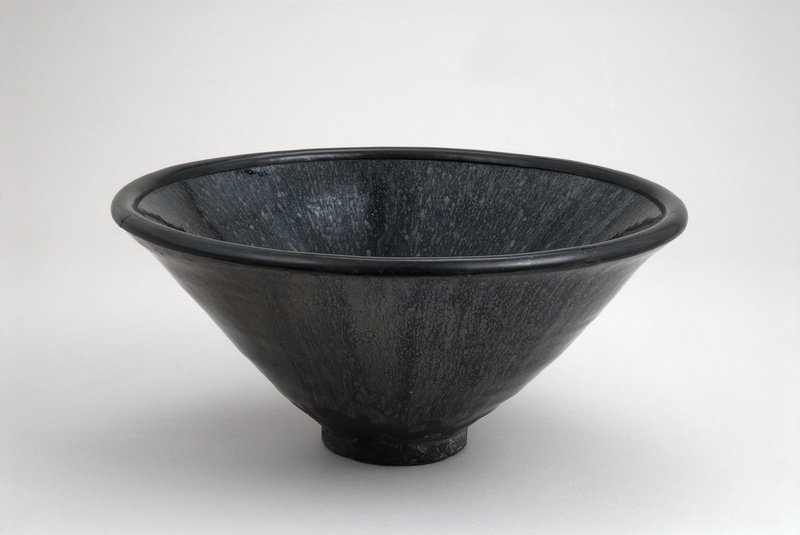 In particular Jian started making black glazes at a time when no where else in China was that happening, whether this predates the influence of the Zen monks or is in fact a reaction to their needs expressed or otherwise we cannot know. There is no evidence to suggest either but there is evidence to suggest that the potters found a simple source of the black glaze material and then exploited it. Pottery has been made for some 8000 years and the basic process has remained the same for all of that time, clay is dug up and given some processing, even if it is just the removal, by hand, of foreign material. Water is added until it becomes plastic; it is this quality of plasticity, that allows this material to be moulded into a shape and remain there which has been interpreted as both magical and mystical. This can be seen in many Genesis legends and myths including the First Testament of the Bible’s story of God creating Adam. 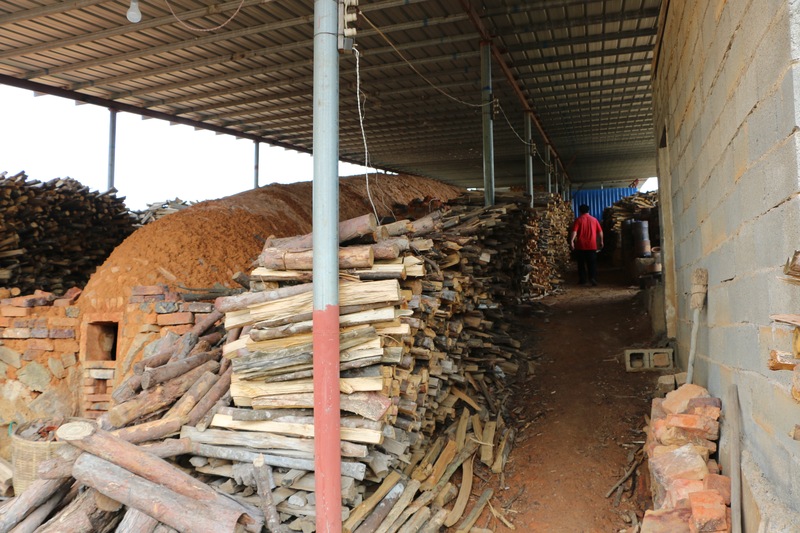 The moulded pot is then dried and subjected to sufficient heat to ensure it has the strength to perform its function. the technology has developed along the way, prehistoric pots where unglazed and fired in open bonfires only get hot enough to sinter the clay minerals together. 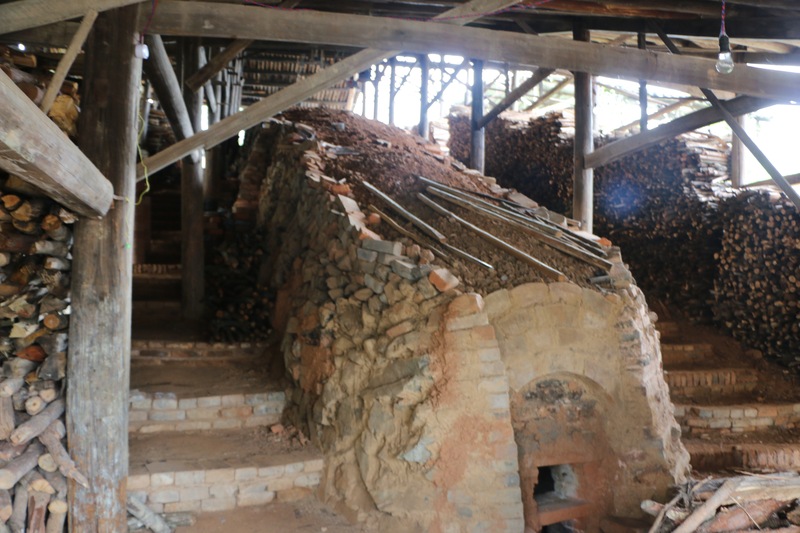 By the mid Song Dynasty kilns in China were way ahead of the development in the west, firing clay to white heat, 1300oC, sufficient to turn clay minerals into glass and vitrify the body. The development of glaze is another story though and comes much later in the story of pottery. Most of the early glazes are developments of the discovery of glass making and are made from the same materials, but in the east, due to the advanced kilns they had developed, it was noticed that wood ash floating through the kiln as a byproduct of the firing settled on the shoulders of pots and melted to form a glaze. 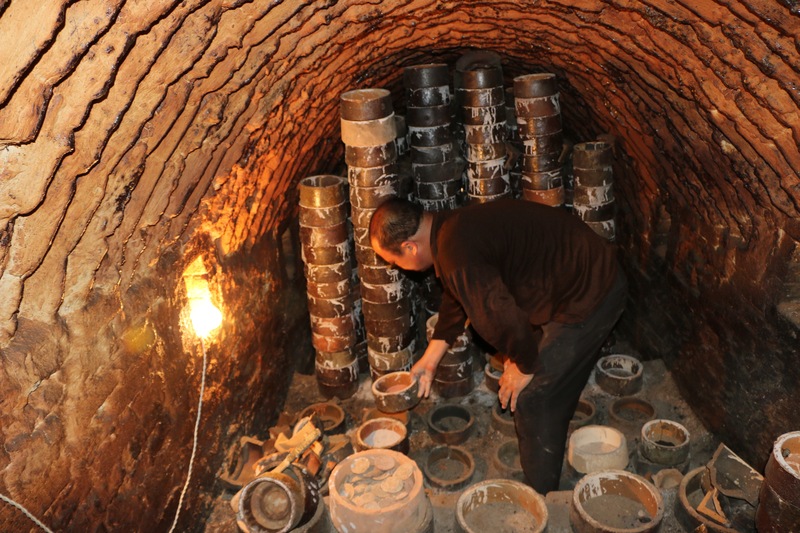 It didn’t take potters long to mix wood ash and clay into a slurry and dip pots into this to make glazes that covered the whole body of the pots. Pottery seems to develop the empirical nature of its practitioners and it is obvious that the development of modern glazes relied on the work of those early potters, taking samples of the materials around them, clays, ashes, minerals and oxides and combining them in endless variations until they got the result they wanted. By the Song Dynasty this was indeed a high art form with many glazes like the jade like celadon, the egg shell blue Kuan, the list is endless, all developed by empirical means, which had reached a peak that in some case has not been reproduced since. 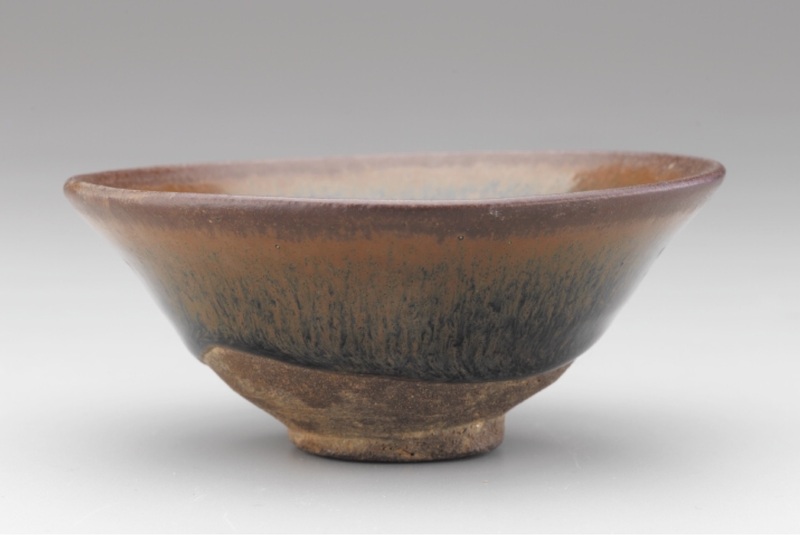 It is the provenance of materials in the pottery village of Jian that allowed for the progression to the qualities of these Song Dynasty High Iron Glazes. An iron bearing local rock with enough of the local red clay for raw glazing with perhaps a little limestone from deposits in the area, or derived from the shells from river molluscs appears to be the basis of this glaze. This material would have been mixed with water and applied to the pots as a slip whilst they were leather hard and once the pots were dried, placed in a saggar that itself would have been placed into a kiln to be fired in a large woodfired dragon kin.